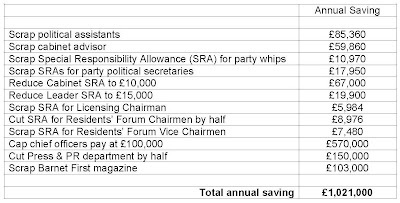 When Lynne Hillan first announced the council’s plans to put elderly residents’ lives at risk in order to save £950,000 a year, Don’t Call Me Dave prepared the table below showing how Barnet could save more than £1 million without affecting front line services. These figures were based on information provided by the council in various public reports. Following the initial public outcry, the council did its sums again and reduced the cuts efficiency savings needed to only £400,000. However, as outgoing leader Mike Freer claims he is always looking to save money, there is absolutely no reason why DCMD’s proposed efficiency savings cuts cannot be implemented. Keep the wardens and save taxpayers £600,000 a year. Simples! Two extra savings you've missed out on. Cllr M Cohen's SRA for Constitution Committee Chairmanship is one. Another is his allowance as Cabinet Member for Planning as it would seem that he doesn't think he is actually needed. At tonight's Cabinet, where the hugely important report on the Core Strategy for the LDF in his name was discussed, he was absent on Council Business (?!). He clearly thinks there is more important business than his own Cabinet Portfolio! What could that be? All was well in the end and Melvin had thought to send his boss, Stewart Murray, who didn't a fantastic job. These figures are still just as repugnant as the first time you published them. I've got another couple of savings. Scrap the budget for "town twinning events". Nice though they may be, buying a few sausage rolls for dignitaries is nowhere near as important as providing front line services for wardens. I'm sure that they could probably get business sponsorship for the hospitality anyway. They should also print all council notices in black and white. Colour adds expense. Do you think a single resident would care if their letters from the council didn't come in Barnet green. Do you think any would even notice. And finally they should post all council vacancies on the council website. Every job arranged via an agency costs approx 10-20% of 1 years salary. I believe there are several hundred vacancies and only 35 jobs posted. There are plenty of other savings the council can make. My list was merely an example. Mike Freer says that backroom costs have already been cut to the bone, but I am willing to bet that savings from reductions in allowances, perks and spin doctors have not even been considered. Why does the council not stop giving RogT money for his services, that qould save lots of money. Tell us RogT, how much money do you get from the council? "All was well in the end and Melvin had thought to send his boss, Stewart Murray, who did a fantastic job. In answer to your question. The Council gives me nothing. It pays the company which I run money for various services we provide, some of which are for people with mental health issues and some of which are for youngsters. As I'm quite sure you are aware, Barnet Council chooses my company to provide these services because we provide the best quality of service at the lowest cost. If you believe that Mike Freer is unfairly discriminating in favour of my company in the award of any business, I suggest you take the matter up with him or the district auditor. I would personally suggest that this is a ridiculous suggestion. In answer to your question, I receive significantly less in income from Barnet Council than I pay in Business Rates to the Council, so I'd suggest that the Council do rather well out of me.